Working in stock control and warehousing within retail is a very important link in the whole process of the retail chain as it’s the central hub of where all of the items the company is intending to sell are kept and from here, they’ll either be distributed to the customer directly or to the stores in which they’re going to be sold. Although a stock controller and a warehouse manager are two different jobs, in some smaller operations, the warehouse manager is also likely to have a more ‘hands on’ approach where he or she will also be responsible for stock control and they may be involved in the likes of ‘picking and packing’ and in distribution. In larger operations, however, a warehouse manager is likely to oversee the receipt, storage, retrieval and despatch of goods and will be responsible for the overall management and planning of the warehouse operation. 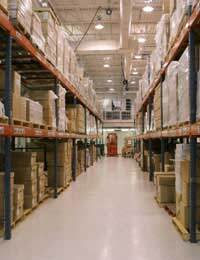 A warehouse manager is responsible for delivering and fulfilling the objectives as set out by the head office. This could include processing orders and overseeing stock control and planning for future capacity requirements. They are responsible for overseeing the maintenance of all vehicles, equipment and machinery and for the management of the overall health and safety of all of the people working within the warehouse as well as things like warehouse security. A lot of warehouse work involves the use of automated and computerised systems and it is the warehouse manager’s responsibility to ensure that all of the staff are trained to carry out their specific duties and that their progress and performance are monitored. Ultimately, a warehouse manager will need to be able to produce regular statistical charts and reports which they can present to head office. Stock controller jobs are more confined to the stock itself within the warehouse and the work does not encompass all of the other issues and concerns which a warehouse manager would have to deal with. The basic duties involve controlling the flow of stock both into and out of the warehouse (although you’ll also find stock controllers in actual stores too). In retail particularly, one of the most important aspects of a stock controller’s job is to make sure that there are adequate supplies of merchandise to meet the demand of customers. When in receipt of item from suppliers, it’s the stock controller’s responsibility to unpack the items from the boxes they come in and to inspect them. Once done, the acceptable goods are then arranged on shelves, on racks and in bins and marked with the proper identification codes and the correct prices so that they can be retrieved easily when needed out on the shop floor. Often they’ll use hand-held scanners to bar code the items and then the information is fed into a computer so that records can be kept of the total inventory of each particular item both in the stock room or warehouse and out on the shop floor. This is a fundamental aspect of retail so that as shelves get emptied as goods are sold, the computerised system can then tell the stock controller that more stock needs to go out onto the shop floor. Possibly the most demanding areas of stock control and warehousing are to be found in the food sector and within other areas in which goods only have a short life span as the job of stock controller then would include rotating items, dating the goods and a warehouse manager would also be responsible for maintaining appropriate temperature and humidity levels. At its most basic, recruits at junior level can often be trained on the job. However, as more and more warehouses become automated and computerised and as technology advances even further, training becomes more sophisticated and retraining and learning new skills is the norm.